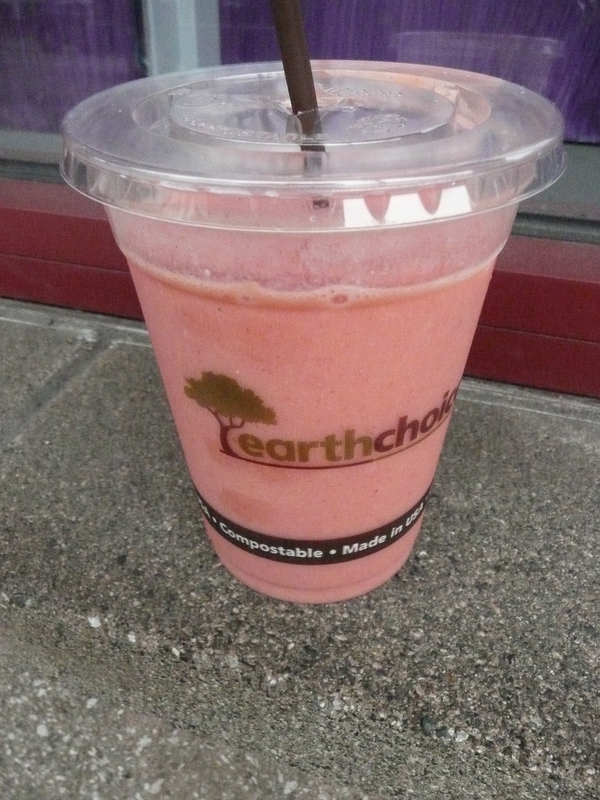 Update Winter 2011 – Portland Smoothie Company has closed. It has been awhile since our last comparison so it is time. But this time this reviewer brings you a cart versus a storefront review! Since it’s finally warm, you may be asking, “Where can I get a good smoothie downtown so I can cool down?” Well, I am here to help you decide from two of the newer, more prominent smoothie joints downtown. Cost $4 / 16 oz $4.75 / 20 oz. 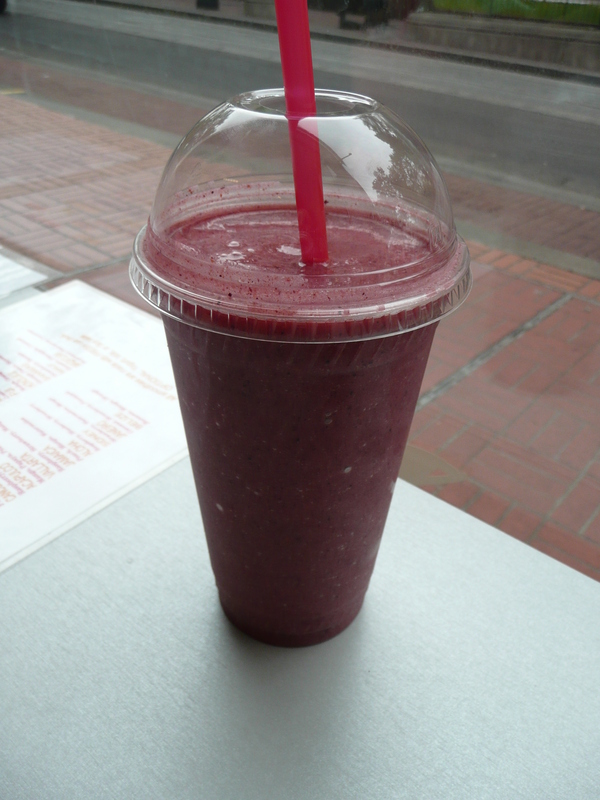 Portland Smoothie Company (PSC) offers smoothies and juices from a well stocked cart. The menu is small with a few suggestions, but you’re welcome to choose your own. All but the soy protein powder is vegan (it contains bee pollen). PSC offers a variety of frozen and non-frozen fruit along with fresh, jarred juices, and boxed alternative milks, some organic, some not. Just ask about what is organic, or anything else because the service is friendly and the fruit is handled with care. This cart does not serve traditional lunch, but you can get a combo meal with the next door neighbor, Sonny Bowl. For $6 you get a small Sonny Bowl and a 16 oz. PSC juice. It’s great to see carts teaming up to offer specials. They even allow you to share their tables. I would love to see a combo with Bloop in the future, but it doesn’t sound like Portland Smoothie Company will be opening earlier. 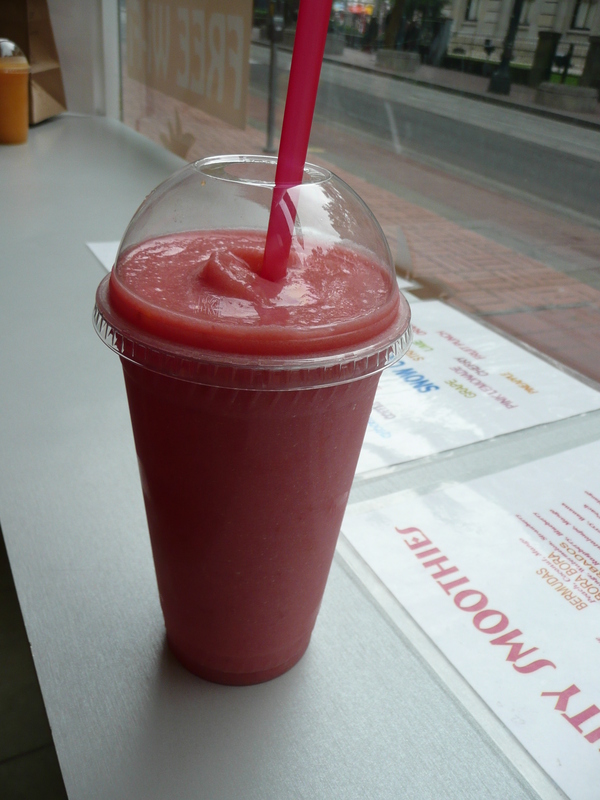 Fruitlandia provides smoothies, juices, milk shakes, and paninis, but no non-dairy milks. The menu appears to layout every fruit combination possible which is a bit daunting. All fruit appears to be conventional since nothing is marked as organic. 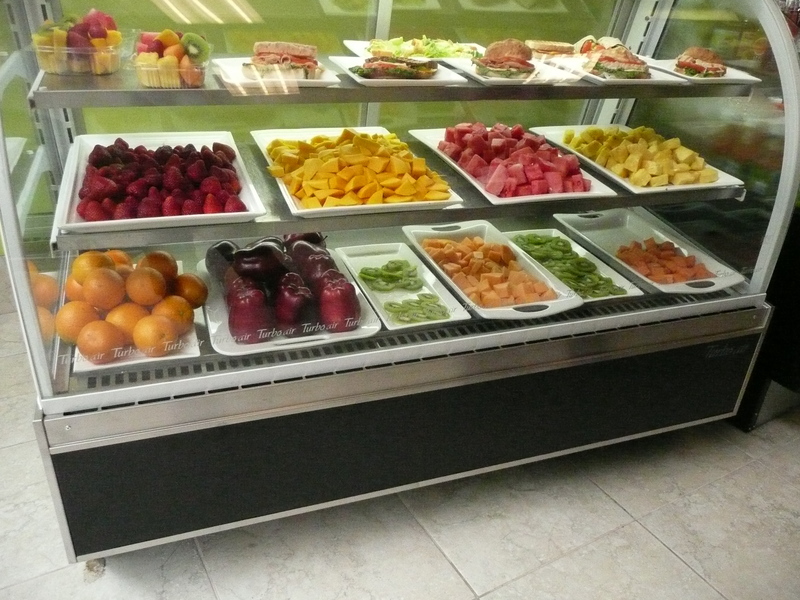 All pre-cut fruit is displayed in a display cooler, along with wilted samples of their sandwiches and paninis. The non-cut fruit is set in baskets on the counters and looks beautifully inviting. Since the fruit is blended fresh it limits the additional liquid that is required, however ice and water are added as needed, which does minimize the flavor of the fresh fruit. Using such a powerful blender has the advantage of a shorter blend time, but several of my smoothies have contained chunks of fruit or ice. If you do encounter any issues, the servers are friendly and helpful. The paninis can be made vegan with modifications, but really don’t appear as a good vegan downtown lunch option with carts like DC Vegetarian or No Fish Go Fish within close proximity. Being located on SW Yamhill, the location is superb for downtown people watching as you sit at their bar utilizing their free wi-fi. So which does this reviewer prefer? 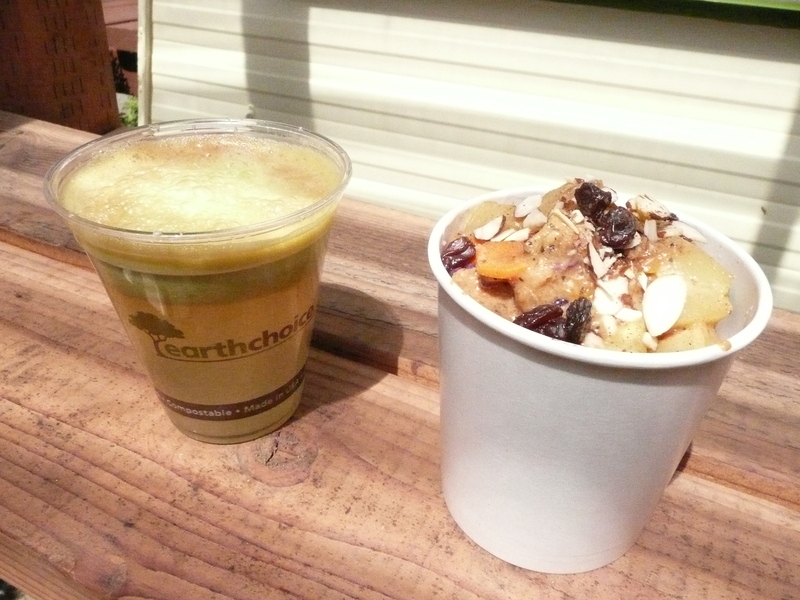 The scores above are obvious, they are both great in their own ways, but Portland Smoothie Company comes out ahead because of the vegan options available, and the small attention to detail. While I prefer fresh fruit, the combination of both fresh and frozen fruit with non-dairy milk or juice, reigns supreme over fresh fruit blended with ice and water. Both places offer good service, and even with the bar seating and free wi-fi available at Fruitlandia, the personal touch a cart owner can provide nudges PSC further ahead. Try then both out for yourself and see which you prefer! 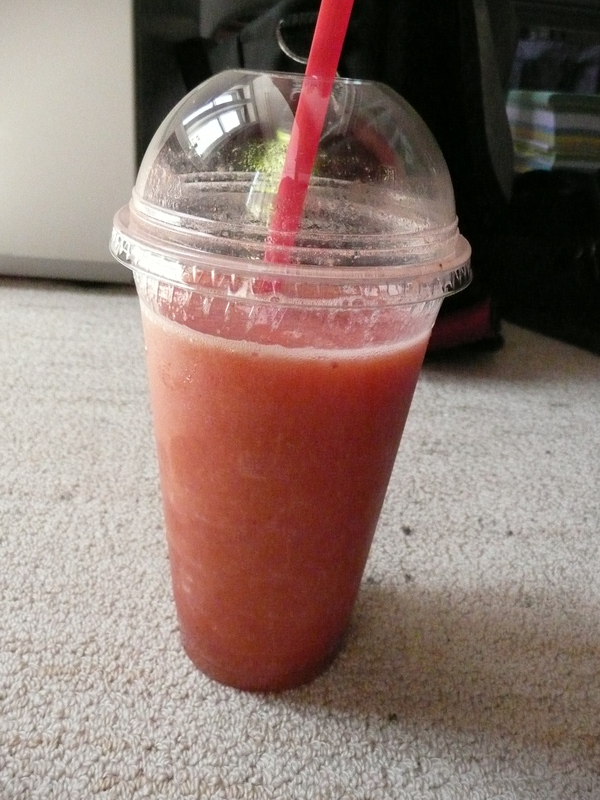 Or compare them with the many other smoothie options popping up around town, just be sure to ask for no dairy! Your chart lists Fruitlandia as having frozen fruit, but the pic shows some fresh jawns… Just a heads up! Thank you for the correction! Fruitlandia has only provided fresh fruit.